Byblos Bank commissioned Dar Al Handasah Shair and Partners to issue the new design in record time and Bureau d’Etudes et de Travaux Hydrauliques et Electriques was awarded the contract as the main contractor. 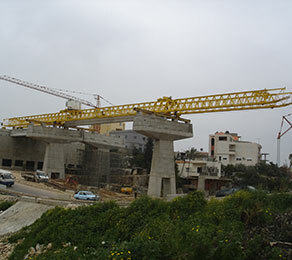 Fidar’s importance as a vital commercial artery, which connects the northern agricultural and industrial sectors and the Port of Tripoli with Beirut and the south, demanded that the reconstruction process was carried out swiftly. A target of 11 months was therefore set for the reconstruction of the five-span bridge, which meant that when CCL was commissioned to undertake the post-tensioning works, the construction schedule was already very tight. In addition to this, the company had to ensure that the existing roads behind the abutments were not damaged during the placement of the beams. CCL was able to successfully meet the tight construction deadline and ensure the adjoining roads remained undamaged, by installing the 100 precast, post-tensioned beams - each 34m in length - using a launching gantry.